This little 14' Apache skiff cost a mere $1,500. We get so carried away these days with our high-powered center consoles and fancy fishing machines, that we often forget just how much fun—and good fishing—you can have in a small, simple skiff. We also forget that we don’t have to spend $50,000 on a new boat, just to go casting for reds or toss topwater to speckled trout. No, for a modest $1,500 or so, you can get a super-cheap skiff that will do these things, and more. This little 14′ Apache skiff cost a mere $1,500. Case in point: the Apache skiff you see pictured here cost me just $1,500, including the boat, motor, and trailer. Sure, the boat’s nothing fancy, and yes, it has a few years on it (15, to be exact). But the hull is solid, and that’s all that counts. Plus, the motor is significantly newer, runs great, has enough oomph to cruise at 15 to 20 MPH (depending on how many people are aboard,) and at a mere 15 horses burns next to nothing. A three-gallon can is more than enough for a full day of fishing. 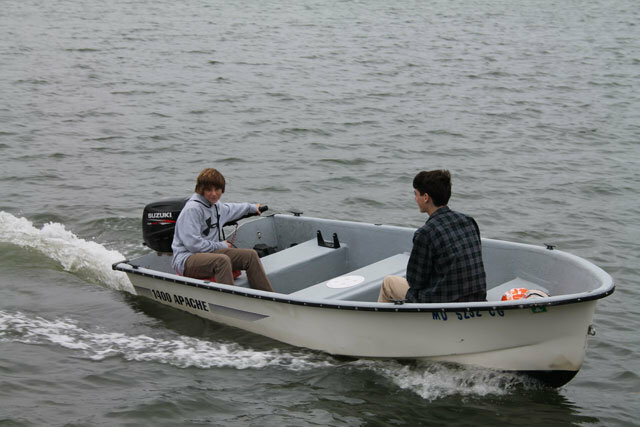 When I acquired this skiff the idea was to get a small boat my boys could poke around in, all summer long. (Read The Boy’s First Boat, which tells the story). A boat to learn on, and in all likelihood, make a few mistakes on. The small investment meant that if (when!) they damaged it, no one would be too upset. It was the perfect “beater” for them to gain some experience with. Here’s the surprising thing: since getting this skiff, quite often I leave my 22-footer in the driveway. For short fishing or crabbing trips in protected water, the Apache is ideal. It’s a lot easier to handle than the big boat, especially when single-handed, both at the ramp and on the water. Running expenses are next to nothing, and I don’t need to haul along a bunch of gear. It may be super-cheap and super-simple, but it’s still super—in a lot of ways. You say you don’t want to risk buying a boat with a used outboard? I don’t blame you. But consider this: you can get a brand-spanking-new 9.9 for around $2,000, a boat like the Tracker Guide 14-V for $1,750, and a matched trailer for $1,245. That’s a comparable rig, all new, for under $5,000. The next time you’re looking at boats, try to remember that we don’t always need triple outboards, 50 rodholders, and an integrated ice-maker to have fun on the water. We don’t have to spend an arm and a leg. We can have an awful lot of fun, in a super-cheap skiff.